It was sixteen years ago when the movies emerged at the forefront of my professional aspirations. The first film that sparked that drive was Disney’s “The Black Cauldron,” which had just been released on VHS after years of being buried in the vaults. Following an eager viewing, I sat down – as I had done so periodically early on when writing reviews for the school newspaper – and cranked out a five paragraph analysis in just a few short minutes. The endeavor had been at the request of an old user-owned web site that initially launched as a petition to release said movie, which was now taking articles from an influx of enthusiastic new viewers as a way to celebrate the long-delayed arrival of their obscure treasure. From that moment on, my new venture merged fluidly with the pursuit of an identity in the new frontier of the world wide web, and words poured from the mind like liquid without obstruction. Sixteen years later, I sit at a desk in contemplation of milestones. What are the odds that the first proof copy of my first volume of articles would show up in the mail on the very anniversary date that my first review went live on the Internet? Who could have guessed that it would reach my hands in the same week that I finished writing my 700th full length film review, which has already broken a long list of traffic records? Fate and coincidence seem to be interchangeable words when projected into windows of perspective, but in these travels there exists an urgency to reflect. Because the world is barreling past us in a sweep of maddening velocity, moments to pause are a rarity. But they must be done, especially if we are to understand anything about ourselves beyond surface intrigue. The greatest tragedy of humanity is that few ever pursue what makes them happy. From the age of 17, I knew instinctively where my passions were stirred: within the images of a great movie. Writing about them had been incidental; on a wintry day in late 1997, I raised my hand in a classroom of aspiring high school journalists when the editor asked who was interested in writing a critique on “I Know What You Did Last Summer,” and that was only because I was avoiding an opportunity to get stuck with another Senior student profile. The result was an article now forever lost in the hedge maze of amateur output. But it nonetheless planted the seed which would in turn be fueled by the joyous implications of the Internet, and in brief intervals for the next year I toyed with the concept until I found a voice that matched my unique perspective. Writing about film ebbed and flowed as a professional pursuit – and then ultimately, a hobby – for several more years. High school set a certain benchmark for indulging in the maddening sensationalism of Hollywood yarns, but it was college that set the path for deeper studies. Simultaneous to learning and mastering the art of working in a newsroom, wise instructors expanded my awareness in the literary prowess of stories and directors who stood distinctly outside of the studio mainframe. In those days, names like Ingmar Bergman and Jean-Luc Goddard were vague and mysterious; after engaging with those well-versed in the heritage of cinema, they became figures of legend. It was then that I decided, in a headspace of structure without human experience, that Stanley Kubrick was probably the greatest and most methodical of all filmmakers, and seeing his last film “Eyes Wide Shut” emphasized the promise – and responsibility – of film to take our awareness to a higher state of being. In many ways, I was a mere centimeter ahead of a decline in standards. Because my education came before abundant misinformation made its way through evolving media formats, I was privileged to work and learn from individuals influenced by the teachings of actual thinkers rather than thrill-makers seeking momentary sensations. That was as much true of the movies as it was reality, too; with age came wisdom and desire, and possessing those qualities meant I was more eager to pursue the independent mind-benders screening in the downtown multiplexes rather than the synthetic action vehicles playing on the hill. Why? Because they involved thoughtful discussion points that inspired a dialogue. Think about the last time any group of people got together to wax philosophical over “Transformers,” and you will see my point. Which brings us to now, a moment of startling hindsight that arrives after a year of consistent online writing. What brought David Keyes, a once-dedicated online movie critic, back to the fold in a time when the internet was overrun by bloggers and shapeless psycho-babble? It’s as much about personal dreams as it is about responsibility. At age 8, a school teacher forecasted that I would one day write a book – of what, who knows, but I wagered she suspected something fictional. I loved to write stories in those days, and daydreamed about running amongst the poppies outside of the Emerald City. It was a dream I subscribed to well into my early teens before online writing opened up a new gateway to my linguistic desires; after that, the drive to achieve that goal was sidelined by brief patches of inspiration that would evaporate quickly, and undermine the dedication. Because movie reviews offered less intrusive (and time-consuming) opportunities to express, they became a functional essence of my being; I depended on them like a physical trainer depends on crunches. But then, at the close of 2013, an idea came to light: why not just put together a year’s worth of movie-related articles, published on my website/blog, and release them as a collection? The advent of the eBook offered this golden opportunity much in the same way the invention of the Internet allowed many of us to find voices without being staffed on newspapers or magazines. 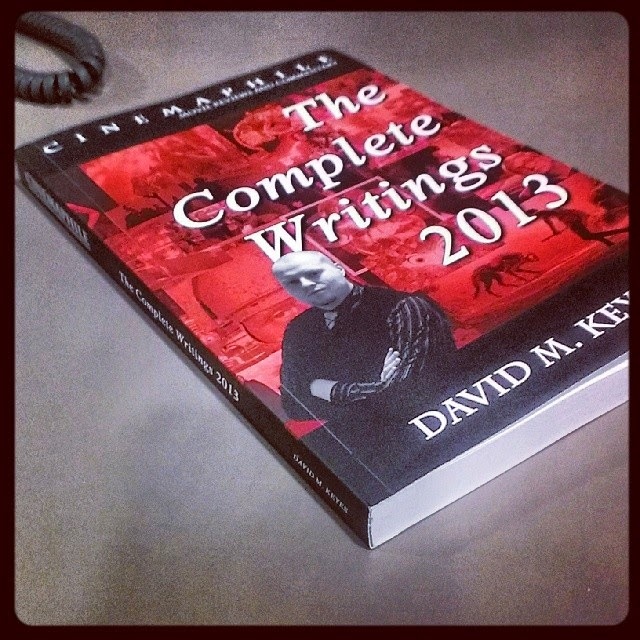 In January, I published “The Complete Writings 2013” on the Amazon kindle store, and the first phase of my greatest dream was achieved: I had created a tangible product, and done so in the format that most of my writing was founded in. A friend observed early on that the idea was ludicrous. “No one wants to read a random set of movie reviews by buying a book unless they have a theme,” he said. That was never the point. The reason came right down to selfish indulgence: I did it for myself, to be able to say that my work was out there in the online marketplace. Who cares if it wasn’t a financially lucrative venture? The creative urges didn’t stop there. In March I compiled a second volume; in July, a third. A fourth will follow sometime this autumn, and a fifth in the new year that will collect all of the material of 2014. But that has not been enough to satisfy this new craving, either. In tossing around ideas for more theme-oriented books on movies (one premise would have me write about a series of films revolved around Marvel comic book adaptations, or films made about Nazi Germany and the Holocaust), the idea also came about to take the eBooks to physical editions. That was as scary a prospect as returning to the blogging world after such a lengthy sabbatical. What was the point? Again, maybe there didn’t need to be one. I will never be the man who makes a living out of being a film critic. That is a label no longer necessary to possess. But I am a lifelong student of film whose love of it emerges through writing that is my own, and if satisfaction comes from that – just as any other joy in life – then that is enough to warrant the drive. In re-reading the material of my first physical volume to prepare for commercial publishing, I am beyond proud to be part of a culture of film that sees past mere special effects. There is art in movies; the skills of directors, cinematographers; editors, musicians and writers often merge into a flourishing unison, and we carry the capacity to absorb them into our individual experiences. There is a distinct lack of foresight permeating from the modern world of blockbusters that is disheartening; while some mainstream endeavors, like the recent “Guardians of the Galaxy,” can remind us of the promise of the multiplex, others like the overwrought “Godzilla” offer little beyond momentary thrills that are forgotten in speedy intervals. All viewers must establish a connection with a movie screen in order to discover what they are looking for, but how can we expect them to look with more penetrating conviction if Hollywood is not willing to take us beyond the surface as often as it should? If the arts are conduits for the most valuable of human lessons, then that means we all, as educated enthusiasts, carry a responsibility to pass down those teachings to generations of youngsters who are weathered by simplification. Social networking detaches us from human interactions. Twitter and Facebook reduce our thoughts to momentary sound bites. Smart phones seem to simply provide scenarios in which we can take “selfies” or pictures of our dinners, and our audiences find sole amusement in that. Knowing the trend of our culture, is it any wonder that the lessons of the past – be they in movies, music, or genuine history – are becoming lost to the advancement of our civilization towards technological dependence? To offer insight into our world – and be willing to do so in stretches of more than 150 characters – is a responsibility more than anything, and we are obligated to instill those values in young minds before they become rotted away by the bottom-feeding mentality of sensationalism and fictional rhetoric. When this all began again in last June, there was still the nagging question of “why bother” lingering behind the drive to simply feed into a personal passion. Was there a point to writing beyond personal ego-stroking? Was anybody listening now, especially so long after I had disappeared, and in the context of so many other writers flooding the internet to write about the movies? The answer is yes, because this all has allowed me to engage with people again from a place of information. While audiences are relative, mine is satisfactory to my needs. People do listen and learn, and inspire spirited discussions. 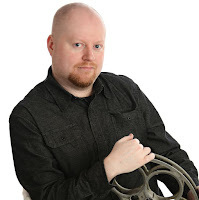 And as long as there is an ear out there that is encouraged to think beyond traditional merits in learning a thing or two about the cinema, then my voice – be it here online, or in a book – is doing exactly what it was meant to do.